Whether it is sensors, lights or displays: More and more electronic components in the automotive sector are being printed. And there are no limits to the design. From March 19 to 21, 2019 LOPEC in Munich will provide information about new developments and trends on the market for printed electronics. One focus of the international exhibition and the accompanying conference will be on applications in the automotive industry. Vehicle construction is developing into one of the largest markets for flexible and printed electronics. Market research institutes are forecasting a strong increase in market volume for the sector over the coming years. LOPEC 2019 picks up on that trend and focuses on the automotive industry. “The industry is on the verge of change,” says Ashutosh Tomar, Principal Engineer Technology Strategy at Jaguar Land Rover, “the vehicles of tomorrow must meet an increasing amount of demands.” In the course of the development of alternative drives and autonomous vehicles, printed electronics play a key role in ensuring the high demands on safety and comfort. More than 100 sensors are already installed in today’s automobiles. This number is going to become even higher in the future. Further features are data processing and control elements, displays and numerous other hardware components. With conventional electrical components and their cabling, there is hardly any room left in the vehicle interior for the occupants, Tomar points out. At LOPEC, exhibitors from all over the world will present innovations to solve this problem: Electronic components that are so thin and flexible, often transparent, that they can be integrated into side panels, seat covers and windows, in steering wheels, dashboards and other elements of any shape. Injection molding, thermoforming or 3D printing? “Sensors, lighting, data processing—all this must come together in modern user interfaces. Printed electronics are the best option to realize this integration,” emphasizes Wolfgang Mildner, owner of the consulting and technology company MSWtech and General Chair of the LOPEC Conference. Dashboards with integrated electronics are already mass-produced by injection molding. The process for these so-called ‘in-mold electronics’ involves printed sensors and other elements being embedded by the manufacturers into the plastic surface during injection molding. Thermoforming of plastic materials, also known as deep-drawing, is also suitable for the integration of prefabricated printed electronic components. Thanks to the ongoing development of conductive printing inks and pastes, 3D printing is another option for the production of functional components with integrated electronics. “The automotive industry is currently in intense discussions about which technology is best suited for which purpose,” explains Mildner. The prerequisite for injection molding and thermoforming is that printed electronics can withstand the temperatures and mechanical stresses during molding. 3D printing, on the other hand, is currently rather used for the production of small quantities and individualized components. At LOPEC, company representatives and scientists will speak about their experiences with the production of printed electronics in 3D. This includes, for example, a Technical Conference session on “3D Structural Electronics” as part of the LOPEC Conference. Moreover, Professor Dr. Reinhard Baumann of the Fraunhofer Institute for Electronic Nano Systems in Chemnitz will introduce the project “Go beyond 4.0” in a keynote during the Plenary Session. Six Fraunhofer Institutes from the research network are investigating how small series and unique specimens can be produced cost-effectively under mass production conditions. One demonstrator of the project is a smart car door with integrated printed electronic structures. The fact that printed electronics can be used to create functional surfaces without buttons, knobs and cables is particularly pleasing to car designers. 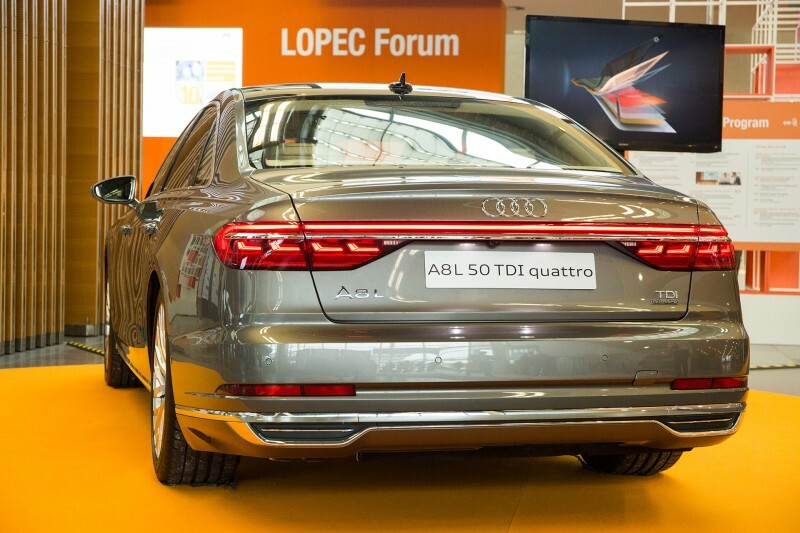 Their creative freedom is one of the focal points of the LOPEC panel discussion on Wednesday afternoon, 20 March, titled “3D structural electronics and the future of automotive design”. Since both the driving experience and the outside world retreat into the background in an autonomous car, the interior is gaining in importance and is increasingly becoming a selling point. In the future, passengers will use travel time to work or relax. Individually adjustable interior lighting, combined with sensor-controlled shading in case of strong sunlight, is intended to provide the appropriate atmosphere. In addition, the number of displays in the vehicle interior will continue to increase. They not only replace conventional displays, but in autonomous vehicles they also serve as a human-machine interface and, above all, for infotainment. Car manufacturers want to implement both innovative lighting and meet the increasing demand for displays with printed organic light-emitting diodes (OLEDs). With the flexible, flat and extremely energy-efficient OLEDs, the interior can be virtually wallpapered. Further information and background data can be found at www.lopec.com.